Pablo Barrios and ASD Farfala. 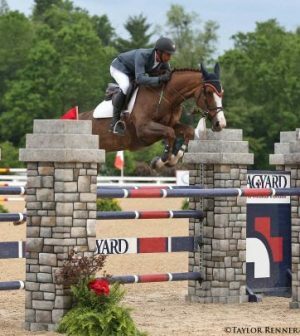 Lexington, Ky. – May 12, 2016 – The 2016 Hagyard Challenge series, sponsored by the Hagyard Equine Medical Institute, kicked off its eleventh year at the Kentucky Horse Shows on Thursday evening with the $35,000 Hagyard Lexington Classic. Sixty-six horse and rider combinations went head-to-head in the CSI3* competition, but it was Pablo Barrios (VEN) who took the victory with ASD Farfala. The talented pair beat out of a field of 14 during the jump-off, tripping the timers in a speedy 37.940 seconds. Riders battled the elements during Thursday’s class, but the rain did not faze ASD Farfala, owned by Barrios, who has only been riding the 12-year-old Warmblood mare for a month. 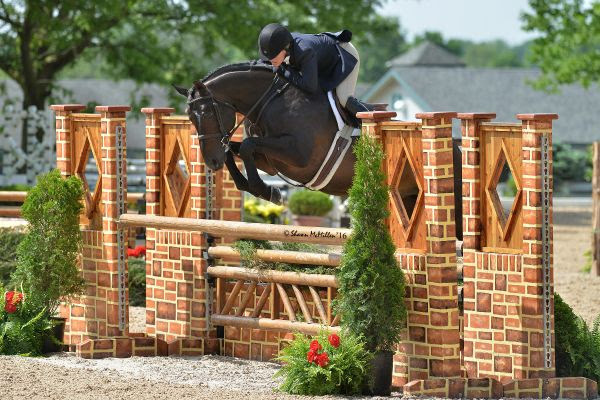 The Kentucky Spring Series marks their first horse show together, but the two are already demonstrating a winning partnership. “I’ve known the mare for a long time,” said Barrios. “It belongs to a very good friend of mine, Americo Simonetti. He is a legend in the sport in South America from Chile and he kindly let me ride this wonderful mare that I’ve known for a long time. Aaron Vale (USA) and Quidam’s Good Luck, owned by Troy Glaus, were the early pathfinders as well as the fastest pair to navigate the technical first round track, designed by Bernardo Costa Cabral, finishing in a fault-free effort of 74.100 seconds. 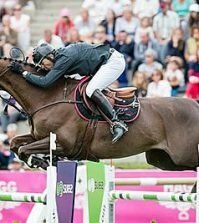 The two later returned to the jump-off finishing double clear in 38.210 seconds, just one second behind Barrios claiming second place honors. Vale also finished double clear again placing third with his second mount of the evening, Finou 4, owned by Thinkslikeahorse, in 39.540 seconds. “I saw Aaron and I knew he was very fast,” said Barrios. “I knew he had a horse behind me and I really tried. I saw him doing seven strides one to two. My plan was to do six or seven with her and I made it and I think any other horse would have had fence 15 down but she just left it up because she is amazing. I’m so excited with this mare and I’m thankful to get to ride her. Barrios is no stranger to the winner’s circle at the Kentucky Horse Shows. He won the Hagyard Challenge series back to back in 2013 and 2014 and is already off to a strong start in the 2016 series. “I have a good vibe here; I feel like this is home,” said Barrios. 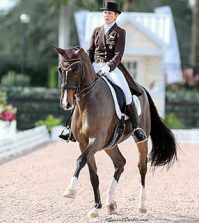 Barrios is also set to compete on the Venezuelan team at the Rio Olympic Games this summer with Antares, his 11-year-old Dutch Warmblood gelding. “I’m going with Antares,” said Barrios. “I’m showing him very lightly. He showed three times at WEF. I used him a lot last year because my mare got hurt. I’m starting to use him a little bit more and working on the fitness when I run him so he gets a little cardio. This is the time to do it before the Games. Then, I’ll keep him a little fresh for the Games; that’s the plan. 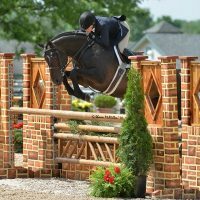 The Hagyard Challenge series consists of seven grand prix classes to be held during the 2016 show series at the Kentucky Horse Park. Following the final event, a cash prize of $50,000 will be awarded to the rider accumulating the most points throughout the series as well as a $10,000 prize for the reserve champion. Throughout the summer, the top riders from across the nation will gather to compete over challenging courses and vie for the winning title and valuable points toward the $50,000 Leading Rider Bonus. The Kentucky Spring Classic, May 18-22, will host the second $35,000 Hagyard Lexington Classic CSI3* on Thursday, May 19. 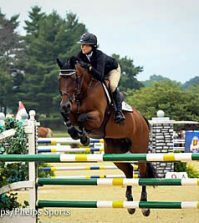 Four more Hagyard Lexington Classic grand prix events will be held during the Kentucky Summer Horse Show, the Kentucky Summer Classic, the Bluegrass Festival Horse Show and the KHJA Horse Show. 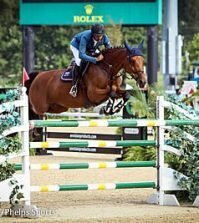 The series concludes with the $65,000 Hagyard Lexington Classic during the Kentucky National Horse Show. Following that exciting competition, the winner of the $50,000 Leading Rider Bonus will be announced and presented with the cash prize by the Hagyard Equine Medical Institute. New this year to the Hagyard Challenge series is the $200 Best Turned Out award, sponsored by Bob Mickler’s. The award goes to a well-deserving groom following each grand prix. Following Thursday’s competition Andre Luis, groom to Mark Bluman and Uitteraard of Stransky’s Mission Farms, won the first Best Turned Out award of the series. Kelley Farmer and It’s Me had another banner day in the Stonlea Ring at the Kentucky Spring Horse Show Thursday claiming the Hunter Grand Championship sponsored by Visse Wedell at Douglas Elliman Real Estate. Farmer swept the over fences classes in the Green Conformation Hunters with the 8-year-old Warmblood stallion It’s Me, scoring the division championship and going on to claim the Grand Hunter Championship. Wedell has been a great supporter of the Kentucky Horse Shows sponsoring grand championship prizes in multiple divisions. “I love that a stallion won,” Wedell said. “Kelley actually rode a horse of mine a long time ago for me so I’m thrilled that they were able to be Grand Hunter Champion at the first horse show here in beautiful Kentucky. Scott Stewart scored a hat trick today winning championships in three divisions. He won the Regular Conformation Hunter Championship aboard First Light, the Second Year Green Championship on Catch Me, and finished out the day winning the High Performance Hunter Championship with A Million Reasons, also bringing home the Reserve Championship with Cameo. Friday will see the Amateur Owner Hunters taking over in the Stonelea Ring. Sunday is “Derby Day” with the $15,000 USHJA International Hunter Derby and the $5,000 Hallway Feeds USHJA National Hunter Derby taking place. For more information on Kentucky Horse Shows LLC and the Kentucky Spring Horse Shows series, please visit www.kentuckyhorseshows.com.